We are a family business, with over 25 years experience, offering a convenient, friendly and personal service. We could visit you daytime or evening and even on a Saturday morning. After discussing your needs and measuring up, you could receive a quote there and then. A supply-only service is also provided. 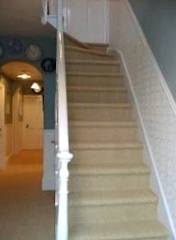 Stewart is a member of the National Institute of Carpet and Floorlayers, with Masterfitter status since 1995. We do floors and we do them well. Guaranteed! Please contact us for further information or advice. If you arrange a home visit, we can bring a wide range of product samples to you.